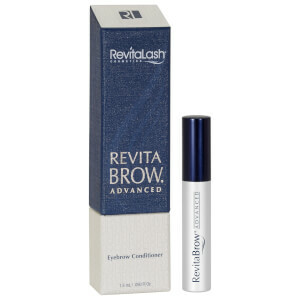 Condition your arches with RevitaBrow Eyebrow Conditioner; a breakthrough, category leading conditioner protects against brittleness, breakage and environmental aggressors to create soft, velvety brows. Blending high-impact proprietary technology, peptides and botanicals, the formula is designed to saturate the eyebrows with moisture to keep them soft and give them some luxurious shine, whilst enhancing sparse or damaged areas. Once a day, apply to clean and dry eyebrows using short upward motions. Aqua, Disodium Phosphate, Glycerin, Biotin, Cellulose Gum, Phenoxyethanol, Chlorphensin, Phosphoric Acid, Dechloro Dihydroxy Difluoro Ethylcloprostenolamide, Butylene Glycol, Calendula Officinalis Extract, Panax Ginseng Extract, Serenoa Serrulata Extract, Camelia Oleifera Extract, Triticum Vulgare Germ Protein, Pentylene Glycol, Biotinoyl, Tripeptide-1, Octapeptide-2.